The term or name Transkei comes from two root words: ‘trans’ (cross over) and ‘Kei’ (the Great Kei River). It is a region or area located on the south-eastern tip of Africa, bordered on the north-west by the Mountain Kingdom of Lesotho and on the south-east by the Indian Ocean, on the northeast by the Umtamvuna River, and on the southwest by the Great Kei River. Its total geographical area is 41,000 km2. The Transkei is larger than the Netherlands (about twice the size of Massachusetts). Historically, white settlers pushed the Xhosa speaking tribes north, stopping at the Great Kei River. These settlers viewed the primitive Transkei as too wild and dangerous to venture north, and would not cross (trans) the Great Kei River, and accordingly the name “Transkei” got its name. The Transkei is homeland to the Xhosa (isiXhosa speaking tribes). The Transkei began self-governance in 1963, finally being recognized as the Republic of Transkei in 1976. In addition to a president and parliamentary cabinet, the Republic of Transkei was also governed by tribal authorities, which were led by chiefs, tribal kings, and paramount chiefs. In 1994, under great pressure from South Africa, the Republic of Transkei relinquished its independence and was swallowed up by the Republic of South Africa. The Transkei is located at latitudes of 30-33° south (a little more than 2,000 miles south of the equator). It has 1700 km of coastline, and is commonly referred to as the “Wild Coast”, due to its untamed nature and lack of development. 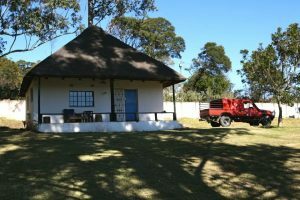 From its rolling coastal hills to the foot of the mighty Drakensberg Mountains (more than 11,000 feet above sea level), the land is primarily inhabited by tens of thousands of remote tribal villages, which are still governed by local tribal authorities. The population of the Transkei is around six million; 98% are amaXhosa. The unemployment rate is over 70%. The people of the Transkei are primarily supported by subsistence farming, with the main staple crop being millet or maize. Although livestock are raised, they are only eaten at Xhosa ceremonial feasts and special events. Approx. ¼ of South African rain falls in the Transkei. The Transkei has been officially renamed the Eastern Cape, but is still commonly referred to as “the Transkei”.